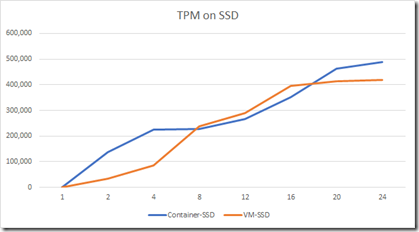 Is SQL Server in a container faster than a VM? 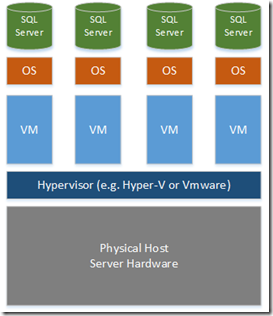 The Hyper-Visor OS is installed onto the host hardware, a physical server in the data centre. 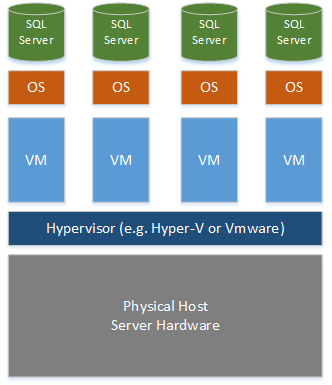 Many VMs are created on the Hyper-Visor layer to host more operating systems. These operating systems can be anything and do not need to share the host kernel. This allows BSD, Linux or old versions of Windows to be installed on Hyper-V 2016, for example. 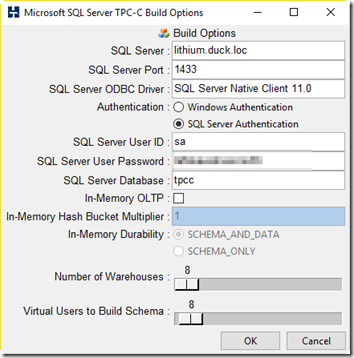 Once the guest OS inside the VM is installed, we install SQL Server as the main application in the VM. The host operating system is installed on the physical server hardware. The container software which hosts and manages the containers is installed on the host OS. 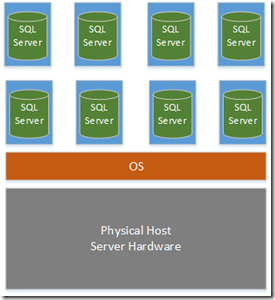 In Windows this is the Windows Containers feature and can only be used on Windows Server 2016 and later. Containers have been around for a long time on Linux and the post popular is docker which uses RunC as the base container software. There are other container engines out there (for example LXC), but we won’t go into that here, this blog post is long enough already. 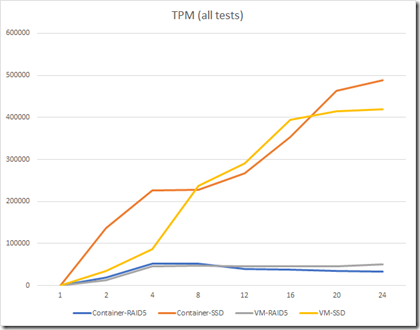 With this in mind it would seems reasonable that containers should outperform virtual machines for databases as there are less layers between the database engines and the hardware. Right? I was surprised by what I found. Before we go through the test results, I will take you through how I set it up. 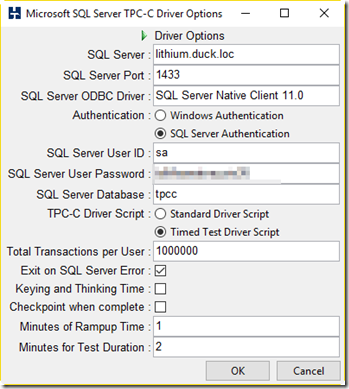 Because I’m installing SQL Server over WinRM, we must either use delegation or use CredSSP. When using CredSSP you can’t use Enter-PsSession because that caches credentials so we need to use Invoke-Command to make the WinRM connection. I used CredSSP in this instance and to set it up follow these instructions: http://stackoverflow.com/a/8436654/38211 Alternatively you can set up AD to allow the user installing the account to be trusted for delegation and trust the COMPUTER you are installing on for delegation. Build the docker image from your dockerfile with: docker build -t mssql-2016-dev . Max memory was set to 7GB on both instances. Simple recovery model so we don’t have to worry about log backups impacting performance. Get from http://www.hammerdb.com/ and install the Windows 64 bit version. Here are my settings for this test. 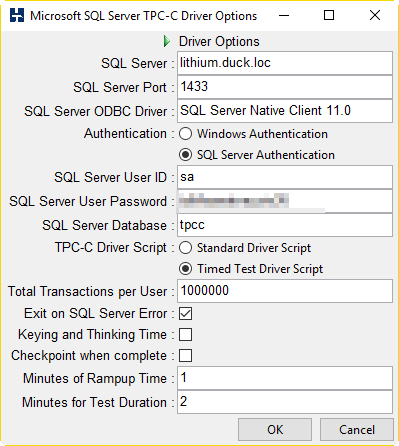 It will take a while (took around 10 mins on my machine) to create the test data depending on the settings supplied above. It is generally a good idea to set the number of virtual users to the number of logical cores on your test box (I have 8). 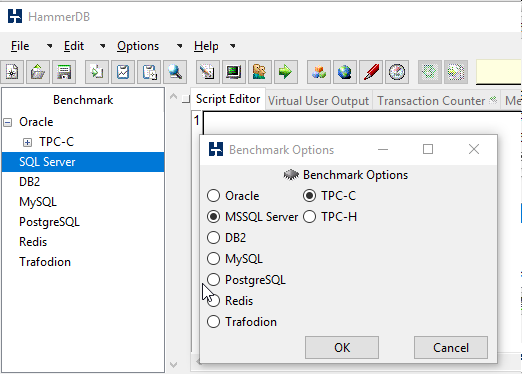 Once you have configured your driver settings, you need to load the TCL driver script into HammerDB by double-clicking on the Load button. Now double-click the Autopilot button and the tests will start. Time for a cup of tea! I also like to run performance monitor as well so I can see that there’s some activity going on. I like to monitor CPU and disk latency with counters Processor:% Processor Time and Logical Disk: Avg. Disk Sec/read and Logical Disk:Avg. Disk Sec/write. The container seems a bit faster up to four users, but then trails off with the VM being faster later on. 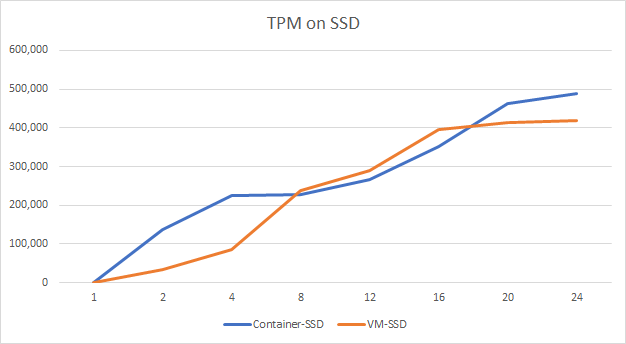 Again, the container seemed much faster than the VM up to 4 users, but then the VM seemed to overtake in performance until the server was saturated above 16 users. 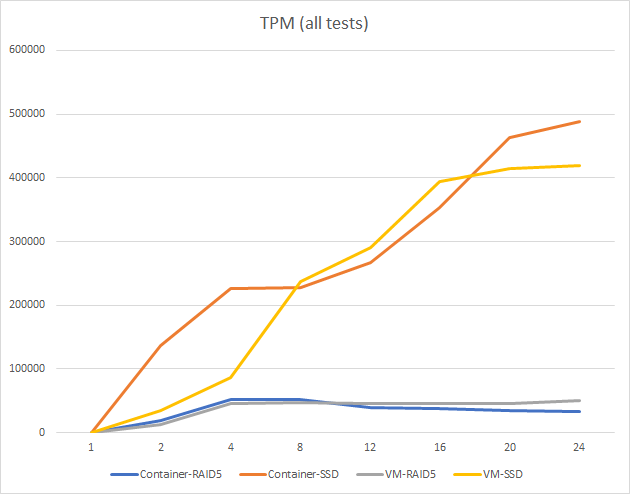 When I started writing this article I fully expected the container to outperform the VM by a factor of 10-20%. However it seems that on my very modest hardware, it is difficult to draw any real conclusions. It seems to me that the stateless nature of containers is not really suited to databases, and there is not a compelling enough reason from a performance standpoint to recommend containers for database hosting in an enterprise environment. That said, I think that containers may be useful for databases when implementing continuous integration (CI) or continuous deployment (CD), especially in a cloud environment because containers take such a short amount of time to create and destroy. 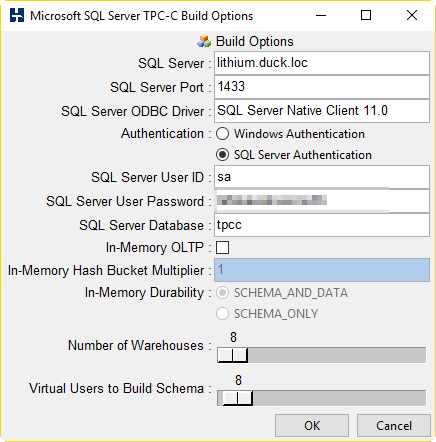 For example on my system it can take around ten minutes to provision a VM with SQL Server running on it using an automated PowerShell script and an unattended install of SQL Server. Conversely a new container takes about five seconds to get up and running. 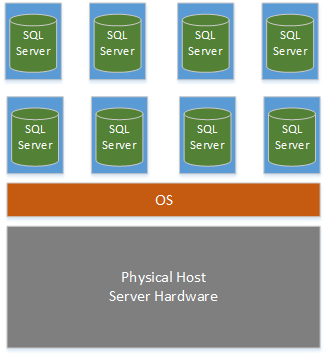 I will be thinking about these issues over the coming weeks and expect another article soon exploring the role of containers for databases in the enterprise and why you might want to look into it for yourself.